Spent three lovely hours on my local creek this morning. I was fishing with my Air Stage Fujiryu 360. I used 12' of size 4 level line and about 3.5 feet of 5x tippet. The fly of choice was a chartreuse streamer. 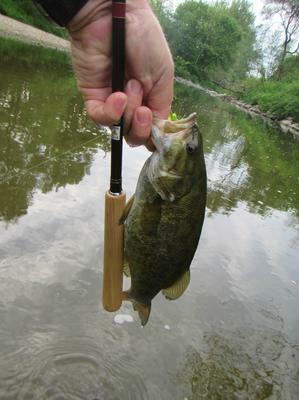 The smallmouth were cooperative and I was able to catch several. My largest was around 12". I had a larger smallmouth on but it pulled free of the fly (isn't that always the way it goes?). Tremendous fun with an awesome rod. This was the first time I used my Fujiryu in warmwater. It was a Christmas gift from my wife. She has found it easy to find and order gifts for me on Tenkarabum. Father's Day is coming up and I have my eye on a rod quiver. Maybe I should start giving some hints. If you have a photo of the streamer enter it and the photo of your fish in the TenkaraBum Streamer Challenge!